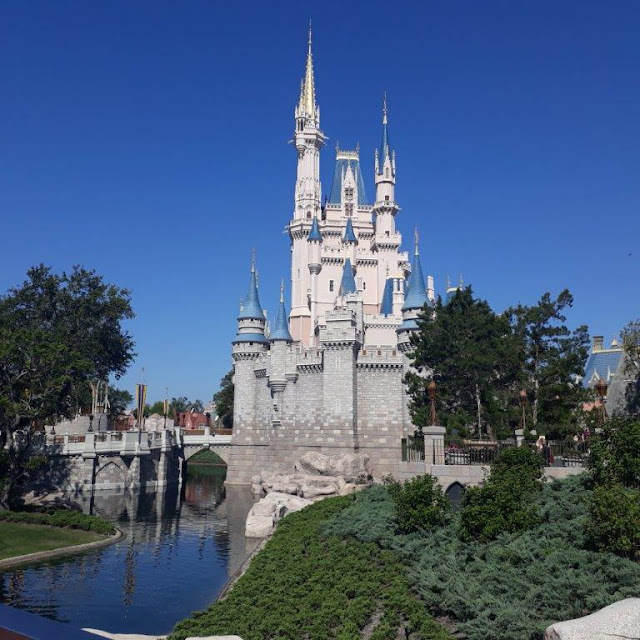 We traveled to Walt Disney World in April 2018, after Spring break, where we spent 19 days. Walt Disney World consists of four parks - Magic Kingdom, Disney’s Animal Kingdom, Disney’s Hollywood Studios and EPCOT. My first impressions of the Castle in Magic Kingdom was that it was a lot bigger than Disneyland’s Sleeping Beauty castle and had a wonderful moat and river around it - just like all the Disney movie intro’s I’ve seen over the years. It was beautiful. We were also able to eat in one of the Counter Restaurants with a view of the castle which was nice. It is not every day you get a window seat with a castle view. The murals inside the castle were nice too and walking through the castle into Fantasyland felt very special - you really entered another world. Wall Murals inside the Castle were awesome. The rides in all the Disney Parks are wonderful. My personal favourites at Walt Disney World are: Avatar: Flight of Passage, Na’vi River journey, Pirates of the Caribbean, Kilimanjaro Safari, the 7 Dwarfs Mine Train, Peter Pan, Jungle Cruise, Soarin’’, Frozen Ever After, PeopleMover, Toy Story Mania and Star Tours. Each of these rides is very unique and for each ride you are totally engrossed in the surroundings. How do you get to Tom Sawyers Island? - by raft of course! Below is me on the 7 Dwarfs Mine train. Wearing a Magic Band, you get a free video of you on the ride via the Disney PhotoPass. The best vibe I had was visiting ‘Adventureland’ in Magic Kingdom. Adventureland is where the Magic Carpets of Aladdin is located. I remember just standing in line and soaking up all the lively music and exoticness of Adventureland. It was just wonderful. And there were so many moments on our holiday I just sat back and soaked it all in. We were really there! We also found some wonderful ‘free’ things to do at Disney Springs (an outdoor shopping and entertainment mall beside a lake). Activities like free boat cruises and some awesome Disney shops that specialise in Disney Art and Food were free to experience and also still felt like you were spending time in Disney, if not in the parks themselves. Disney Springs had a really great atmosphere - there are always live bands playing at the open air restaurants. You can read more here about Disney Springs. Free boat cruises at Disney Springs. I recommend going at Sunset. We normally struggle a bit with finding good food on holidays. Our 10 year old is a fussy eater and it has been difficult in the past finding good food options (plain food) in any Disney parks and surrounding areas. This time I actually did a lot of research into Walt Disney World prior to our trip looking for good recommendations on places to eat. All of the restaurants had menus on the My Disney Experience App, so I was able to research all of this before we left home. I found this trip that our food experiences were a lot better thankfully (I will go into this in a lot more detail in a future post). We paid about $100 USD per day for food (Counter Service Restaurants). This fed the three of us including a 10 year old (it worked out to about $30 USD per meal). We didn’t find Walt Disney World queues or lines to be any worse than any other world Disney Park. We made good use of the FastPasses and Single rider lines. Most wait times were about 20 minutes. Of course the more popular rides like Avatar- Flight of Passage in Disney’s Animal Kingdom the standby line I witnessed was 180 minutes. Our tips on FastPasses can be found here. Florida weather was hot and humid when we were there in April, accompanied by huge downpours of rain. The heat only bothered me on one day (in Disney’s Animal Kingdom), maybe because so much of that park is outside and unsheltered. The humidity was energy zapping. My Dear Husband D.H went and got a soft drink at one point and the electrolytes from the soft drink helped immensely for me to keep going! So make sure you keep your fluids up especially in this park. Coming from Australia, we always wear sunscreen too. It’s a must in Walt Disney World. I have posts on Florida weather here on how to cope with rain. The Cast Members were also super helpful. We chatted to quite a few Cast Members both at the resorts and in the parks. It was nice hearing their stories on how they ended up working at WDW. Sometimes it was even a family tradition. One cast member said his grandfather was one of the first imagineers at Walt Disney World - and his grandad still had a service pin from working there. The magic of Disney was evident just speaking to cast members and how excited they were to be actually working there. Overall, Florida was wonderful. It is probably the best holiday I have ever had. All our pre-planning and research had paid off and it went incredibly smoothly. Florida was also nice and warm which is also a winner for a family holiday - especially as we all enjoy ‘pool time’. We stayed at the Disney All Star Music Resort which averaged $120-130 USD per night. Even the resort pools were heated so there wasn’t even that ‘argh its cold’ feeling hopping in the pool! The other guests at the All Stars resort were all super friendly - all were Disney fans - so it was a lot of fun swapping stories of rides, Disney tips and more whilst in line or in the pool. I felt like the whole Disney Resort was a bit like a village with lots of families. Walt Disney World had a lovely atmosphere and I would recommend this holiday to anyone who wants a great holiday. All Star Music Resort had the best pools! I did not want to go home. I hope you enjoyed reading about our First trip to Walt Disney World. If you would like to comment please do so in Comments as I would love to hear about your experiences. You can also subscribe directly to this blog. I publish weekly, on a Wednesday. I hope to someday visit Disney World. I was never able to as a child. My husband and I are wondering what age would be best to take our children. Do you have any suggestions? Busytykes I was in my early 40s when I had my first trip to Disneyland. I actually thought it would be a once only trip- but we've been to 4/6 of the world parks now and planning a second visit to Hong Kong and Japan next year. Its addictive.